Here's how the GO! Baby works: You lay your die in front of you (foam side up), cut your fabric to the size of the die that you want to use (to waste as little fabric as possible), set your fabric on the die, set the cutting mat on top of the fabric, and roll the "sandwich" through the machine. Easy enough, right out of the box. I already own a Sizzix die cutter, which I use to cut fabric, but the Sizzix is made specifically for paper crafting.... their dies are not designed for quilting or other sewing projects. That's one of the pros of the GO! Baby... it's made specifically for fabric cutting and quilting. 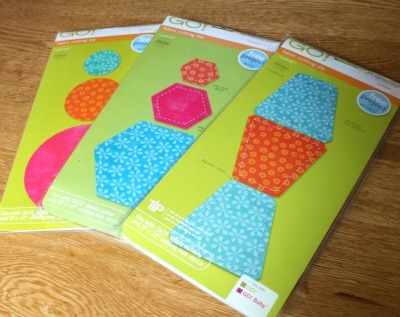 AccuQuilt offers a variety of dies, including squares, triangles, a strip cutter, and lots of cute applique shapes. AccuQuilt offered to send me three dies to test drive. I decided that the squares probably were not a good choice because those are pretty quick and easy to cut out with a rotary cutter and a ruler. I chose the circles, hexagons, and tumbler because those are more complex shapes that are difficult to cut out perfectly by hand. The dies aren't cheap... most range from $20 to $50 each. That's something to think about when choosing which dies to purchase. Another thing that I like about the GO! Baby is that it's compact. It folds up when you aren't using it, so it's much easier to store than my Sizzix. I was worried that the fact that it folds up would mean that it rocks and won't sit flat while you are cutting. I was pleasantly surprised by how sturdy the GO! Baby is. I didn't even need to hold onto the top of the machine while rolling. I really like the feel of this machine. One of my concerns when I first received the GO! Baby was that it would waste a lot of fabric, but I didn't find this to be an issue. 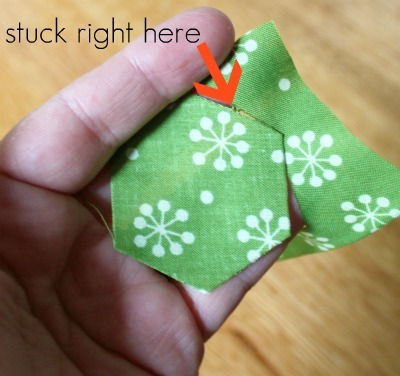 If you cut your fabric to the size of the particular die that you want to cut with, you waste very little fabric. I'd go so far as to say you won't waste any more than you would cutting by hand, at least with the die shapes that I tried. I used some of these to spruce up my Clothespin Bag last week. Earlier I mentioned that I had some minor issues with some of my dies not cutting all the way through the fabric. The circle die didn't give me any trouble at all, but I had issues with both the hexagon and the tumbler dies. At least one little spot wouldn't get cut each time I rolled my fabric through the machine, occasionally two or three spots. These were mostly just a thread here or there. AccuQuilt recommends adding a piece of paper between the fabric and the cutting mat if you have trouble. I tried this several times, but it didn't help me. I tried cutting on different fabric grains, cutting through several layers at once, adding more paper layers... I still had to cut my pieces free with scissors here and there after rolling them through the cutter. Thinking that maybe the dies were damaged or defective, I contacted AccuQuilt Customer Service, told them about the issues I was having, and they immediately sent me new hexagon and tumbler dies (If you ever need AccuQuilt's Customer Service, they are great :) Unfortunately, I continued to have the same issue with these two new dies. After some trial and error, I found that if I add a thin piece of cardboard on top of the cutting mat when I roll it through, it works better. Although it's a minor issue, you should know that you may need to shim certain dies or do some minor scissor snipping here or there on occasion. My overall impression of the GO! Baby... I like it. Obviously the pros outweigh the cons. I'd like to do more quilting, and I'm hoping that the dies I chose will motivate me to make this gorgeous quilt, this adorable mug rug, and an entire tumbler quilt. The GO! Baby will definitely make projects go more quickly, which leaves time for even more projects... yay! The precision and uniform shape you can get with this machine are so important. You can't always get that with scissors. So even though I need to shim some of the dies with cardboard to get the results I want, the GO! Baby is a nice resource to have in my stash of sewing tools. I hope this review has been helpful for anyone who is considering purchasing the AccuQuilt GO! Baby. I really gave the machine a thorough test and wanted to be completely honest about my findings. I have plans to use it for some upcoming projects. In fact, tomorrow I'm going to be posting a tutorial for a project that I made using the GO! Baby. It's actually one of my favorite things that I've ever made, and I'm really excited to share it with you, so make sure you stop back tomorrow to check it out. And now a little something for you... If you are a quilter (or an aspiring quilter like myself), check out the free AccuQuilt quilt and quilt block patterns that are available for download. Just click the button below, register your email address, and you will be able to download 22 free patterns instantly. 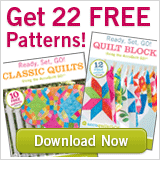 FYI... when you sign up for the free patterns, I earn points in the AccuQuilt Blogger Incentive Program. 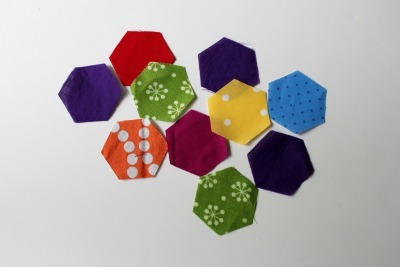 I can then use these points to get more dies and patterns. Just thought you should know. Really thorough review. Thanks for taking the time to share. I am no where near ready for something like this but it is nice to know what is out there. Can't wait to get the basic Grey Pear. Thanks for the honest review. And lucky girl -- have fun with that new toy! I'm glad you shared this. I'm hoping Santa brings me one for Christmas. Thanks! I really appreciate your honest review, Gwen! I've been looking into purchasing a fabric cutting tool, so your review really helps! 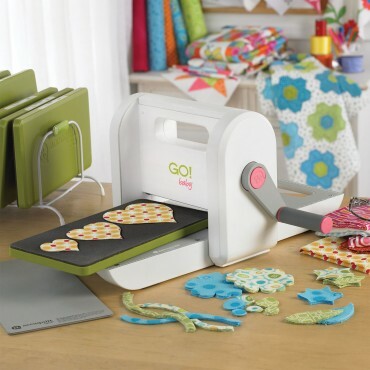 Do you know if you can use this device to cut felt as well? Or would you recommend the Sizzix for that?